Founded in 2001, the Journal focuses on publishing thought provoking new pieces that focus on both original research as well as challenges to previous works. 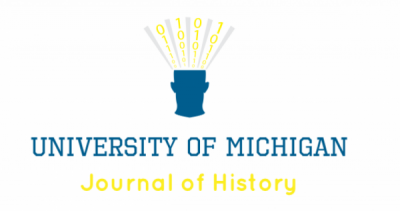 The Michigan Journal of History (MJH) is comprised of undergraduate editors at the University of Michigan whose passion for History has drawn them to this annual publication. MJH does not focus on one particular type of historical submission. Students with focus areas in all types of History are encouraged to submit; we also encourage students from other disciplines including, but not limited to, history, anthropology, political science, law, international studies, area studies, ethnic studies, and gender and sexuality studies to send in their papers, granted they demonstrate a historical theme. If you are either a current undergraduate or you have graduated within the past semester, MJH encourages you to submit your work for publication consideration. Please see the “Submissions” page for further details, and take a look at our most recent publication, Winter 2018 (Vol. XIV, Issue I).